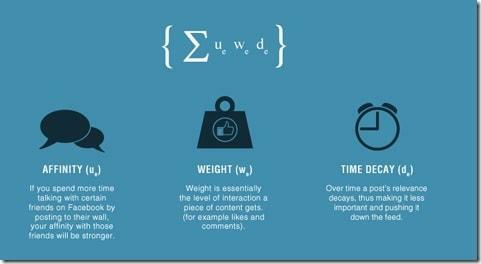 What is Facebook EdgeRank and why is it important? Did you notice that you mostly see posts from the same people and same pages on your Facebook newsfeed? Did you ever ask yourself why you always see status updates and posts by your best friend but never posts from some other Facebook friends? The reason for that is called Edge Rank algorithm which decides what posts you will see and what not. Truth. Every Facebook user can choose how will their feed look like and in which order the post will appear. You can choose to always see the latest posts, no matter who published them by clicking on Recent Stories First in your Feed settings. But most of the users don´t know that or they rather choose Highlighted Stories First, which gives even more importance to EdgeRank. Why should you worry about Facebook EdgeRank? For community managers, FacebookEdge is extremely important because it affects the number of people who see posts from pages that you manage. Of course, every community manager wants that posts from their page achieve the best possible reach. As a community manager, you are fighting with hundreds of Facebook friends and other Facebook pages to push your post into the newsfeed of your fans. Knowing how EdgeRank works will help you do your job as community manager better. The concrete algorithm is not public and only Facebook engineers how it actually looks like, but it is known that it consists of three elements: Affinity, Weight and Time decay. Affinity shows the number which says how connected you are with the person or a page. You are much better connected with a friend with whom you communicate every day over Facebook messenger or tagging in posts than with someone whose friend request you accepted a year ago but never communicated with. The same goes for pages, too. There is much better chance that your content will show up on a feed of someone who regularly interacts with your page by liking and commenting than to someone who only liked your page and never reacted on your content again. Weight means that there is a bigger possibility that certain content will show up in newsfeeds of people than others. This depends again on the amount of interaction on your posts. If a post has a lot of likes, shares and comments, the possibility is better that it will show up in feeds of others too. Pictures and videos are the most interactive content to post on your page. Time decay or Recency says how old is the post. Older posts slowly disappear from the news feed and make a place for the new ones. If you want to achieve the best results with your posts, publish them in a time when most of your users will be scrolling through their Facebook feeds. As we all know, the Facebook algorithm will soon be changing and the change won´t be in favour of businesses and their Facebook pages. As Zuckerberg recently announced, the Facebook feed will in the near future focus on pushing more organic content into users Facebook feeds instead of paid posts from many businesses that are promoted to be shown on your feed. No one really knows yet how exactly this change will affect company pages but it will sure be a lot harder to reach your fans if your content is not something that they are really interested to see. Now you play. Try out different techniques of writing copies for your posts. If it is possible, always publish more photos than text. Be interactive and ask your fans questions. Find out useful information from your fans by engaging with them and with that you will also increase your Affinity (long-term) and Weight (short-term). Also, find out which time is the best for publishing your posts, so as many possible of your fans see it (Time decay). Every community is different so you will have to keep an eye on every page you manage to see which time is the best time. Use trial and error principle, watch and learn. Ilija Brajković is CEO at Kontra digital agency. He has 7+ years of experience with digital marketing. He worked with clients like Microsoft, Renault and Suzuki helping them with their social media efforts. Why Facebook reactions affect your Page visibility?